Australia, March 31, 2017 (SSNA) — SPLM-IO Mission and SPLM-IO Co-ordination Office in Australia would like to condemn in the strongest terms possible the position taken by IGAD Heads of state and Government in their 30th extra ordinary summit on 25th March 2017 in Nairobi, Kenya. This position or communique proved beyond reasonable doubts that some IGAD leaders are part of the conspiracy in South Sudan. We fully agree with our leader Dr. Riek Machar Teny-Dhurgon, when he said, “IGAD decided to abandon its responsibility to continue with its serious efforts that culminated in the signing of the Agreement on the Resolution of the Conflict in the Republic of Sudan on 17th August 2017”. Certainly, this action is an indication that some IGAD leaders are still suffering from the guilt of their plot to kiII Dr. Riek MacharTeny-Dhurgon, Chairman and Commander-in-chief of SPLM/A-IO in July 2016 after they pushed and lured him to Juba without adequate security arrangements. It is our conviction that the communique of Nairobi is another attempt by some IGAD Heads of state and government to protect their false agreement in Juba. 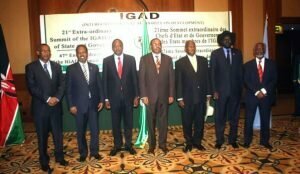 Those IGAD leaders are still entertaining the big lie of “peace implementation” by Taban Deng and President Salva Kiir. This deception led to the collapse of the Peace Agreement and allowed President Salva Kiir to resume his tribal war against different ethnicities in South Sudan and the outcome was famine and genocide. It is absolutely shocking that IGAD leaders can turn a blind eye to the atrocities, which are committed by the dictatorial regime in Juba. This regime has already killed thousands of people, confined or imprisoned more than two hundred thousands of South Sudanese in UN Protection of Civilians Camps in big towns displaced millions inside the country and drove out almost two million to refugees’ camps in neighbouring countries. Definitely, the leaders of the region will be making a cardinal crime, if they continue to support President Salva Kiir in his scorched war in South Sudan. In fact, we are not surprised by the position of IGAD, which is driven by Kaguta Museveni the President of Uganda, who has been fighting on the side of President Salva Kiir and promoting his agenda from the onset of the conflict in 2013. Indeed, some IGAD leaders are blindfolded by their vested interests in the regime of Salva Kiir and cannot see or hear the catastrophe, which has been unfolding in South Sudan. However, let IGAD Heads of state and government be strongly reminded that the futile strategy of isolating Dr. Riek Machar Teny-Dhurgon will not bring peace in South Sudan as it was confirmed by President Orner Hassan el-Bashir and President Konare. Also, let them be reminded that the gallant forces of SPLA-IO and the resilient people of South Sudan will never be forced to surrender to the genocidal regime of Salva Kiir. As a result, we would like to urge IGAD leaders to abandon the lies and tricks of Kiir regime by pursuing genuine peace, which must include all the stakeholders in South Sudan. Finally, we would like to call on the African Union (AU) and United Nations (UN) to take over the peace process and resuscitate the Peace Agreement in order to rescue South Sudan. The doomed Nairobi Communique has clearly indicated that IGAD is not trustworthy in the mediation between the warring parties in South Sudan. Therefore, IGAD has lost its neutrality and credibility and cannot be trusted to achieve sustainable peace in South Sudan. Cde. Peter A. 0. Needing – SPLM-IO Representative to Australia. Cde. Yien Machar Wang – SPLM-IO Country Co-coordinator. CC: Secretary General of UN. CC: Chairperson of AU Commission. CC: Secretary General of IGAD.